Echoes of the Civil War continue to persist in Porter County. The David Porter Camp of the Sons of Union Veterans of the Civil War (SUVCW), for instance, has been very active in restoring, repairing, and replacing the gravesites and tombstones of Civil War veterans interred within the county boundaries. Another significant project currently taking place is the enumeration of every Civil War solider buried in the county, along with a historical perspective of each soldier. 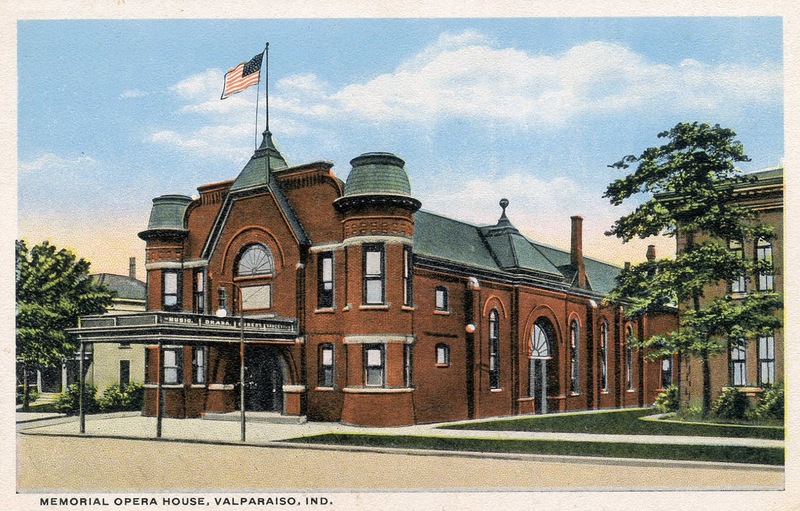 County residents can attend meetings, forums, and entertainment at the Memorial Opera House in Valparaiso. How, exactly, did this building come into existence? The Chicago Fair is hatching a lot of queer ducks, all out to sell the citizens something in the name of the old soldiers, telling those citizens they must make heroes of us. We don't want to be heroes. All we want is to find a place in the community, and fill it acceptably. We want to do something for our home town rather than have the town do something for us. Who wants to cross the square every day and see his own name sticking out accusingly at him, saying some citizens got bilked out of a pair of silver dollars for that name plate? Personally I refuse to stand by and see the citizens bled in the name of patriotism. I don't want any monument. Do you? Apparently, Drapier's speech swayed members into believing that a simple monument, which were very common in communities across Indiana and the rest of the United States, was not appropriate in Porter County. They wanted to do something else. Thus, a a delegation of Chaplain Brown Post members proceeded to Indianapolis to request that changes be made to an Act that was passed December 20, 1865, that allowed counties to appropriate funds for the erection of veterans' monuments. The local G.A.R. members wanted the counties to be allowed to expend funds on the construction of a memorial hall that could be used by the entire community rather than "unwanted monuments;" the law was soon amended on March 9, 1891, to immediately allow construction of memorial halls using county funds. Meanwhile, members of the G.A.R. Chaplain Brown Post, as well their relatives and friends, were canvassing the citizens and businesses of Porter County, soliciting funds for the construction of a grand structure to memorialize all of those soldiers and sailors that served the Union during one of America's darkest hours. A formal capital campaign was initiated to support a building fund. The Women's Relief Corps, an official auxiliary unit of the G.A.R., hosted dinners, fairs, and sales that generated considerable capital for the building fund. Porter County commissioners donated funds, now allowable under the law, for construction of the memorial building. Also donated by the county was the building lot in Valparaiso (Block 29, Lot 3). As a matter of record, the commissioners included a statement in their minutes that the building "shall be forever and perpetually a memorial to the soldiers and sailors of the late war." As to ownership, the building was to be owned by the local G.A.R. Chaplain Brown Post until "after the last member of the G. A. R. shall have passed on, the building shall become the property of the county, to be always maintained as a monument to the Veterans of the Civil War." Valparaiso resident and architect Charles F. Lembke designed the nearly 40,000 square foot building. The outcome of the community's efforts was the erection and dedication of the Memorial Opera House, which was completed on November 8, 1893. By November 11, the building was serving as the headquarters for the Chaplain Brown Post, but also as a center to bring people together and strengthen community bonds. On November 27, 1893, the Memorial Opera House was formally dedicated. Orange Rainey Weaver, Assistant Quartermaster General of the Department of Indiana, delivered the dedication address. General Lew Wallace was originally programmed to give the address, but he was forced to cancel since he had been recently diagnosed with nasal cancer and was ill. The entire week after the building's dedication was devoted to a wide variety of celebrations focused on the new structure serving the community. Opera House in Valparaiso, Porter County, Indiana, 1915. Now, nearly 125 years after its dedication, the Memorial Opera House still serves the intended purpose for which it was built. Porter County is fortunate to have such an impressive memorial to Civil War veterans, as other large community-based Civil War veterans' memorials nationwide were razed either as a result of decay and disrepair or due to development that required the memorials' land to be put to another purpose in the name of progress. Appropriately, the Memorial Opera House is listed on the U.S. National Register of Historic Places. Most Americans are well aware that the Civil War was a drawn out and incomprehensibly bloody affair. It was a different type of war, too, fought with innovations in weapons and the implementation of new types of strategies and tactics, many unproven, to subdue, overtake, and defeat the enemy. Ultimately, as one may expect, the effects of the war were felt most keenly by the soldier and the soldier's family. Anyone who has read the short stories of famed author Ambrose Bierce gets walloped with a dose of vivid images concerning the carnage and misery - the realities - brought about by the Civil War. A Horseman in the Sky, An Occurrence at Owl Creek Bridge, Chickamauga, and One of the Missing are some of his notable Civil War short stories. Bierce's writings came from his own experiences in the war; he was a member of the 9th Indiana Infantry. The 9th Indiana Infantry was organized at Indianapolis on April 22, 1861, for a three month term of service. After the term expired, the regiment was reorganized in LaPorte, LaPorte County, Indiana, on September 5, 1861, with soldiers serving until mustered out on September 28, 1865. Following the conclusion of the Civil War, this regiment was commonly referred to as the "Bloody Ninth" due its participation in many notable battles, including Cheat Mountain, Shiloh, Perryville, Stones River, Chickamauga, Chattanooga, Lookout Mountain, Missionary Ridge, Kennesaw Mountain, General Sherman's Siege of Atlanta, Nashville, among others. Numerous Civil War veterans from Porter County served alongside Bierce in the Bloody Ninth, especially within Companies E and H.
In hindsight, Abraham Lincoln was charged with the almost impossible task of uniting a country. America was very deeply fractured, and not only by the North-South political separation. There were tens of thousands of Butternuts and Copperheads (Southern sympathizers) in the North and a similar number of Union Loyalists in the South. Secessionists believed that Lincoln's election only strengthened the federal government's power over the states, an issue that had been brewing well over twenty years before Lincoln's election to the presidency. Some of Lincoln's own actions during the war were highly questionable, while others were found to be unconstitutional by the United States Supreme Court, such as his suspension of the writ of habeas corpus. So enduring has this letter become that it provides a major component of the plot behind the motion picture Saving Private Ryan. Furthermore, on September 11, 2011, during the memorial ceremony of the tenth anniversary of the World Trade Center attack, President George W. Bush read the Bixby Letter. Lydia (Parker) Bixby, at the time the Civil War commenced, was a widow living in Boston, Massachusetts, who had at least three daughters and six sons. Bixby's situation came to Lincoln's attention in a somewhat circuitous fashion. In September 1864, Massachusetts Governor John Albion Andrew had received a letter from from Massachusetts Adjutant General William Schouler. Schouler had gotten a discharge request from a man named Otis Newhall of Lynn, Essex County, Massachusetts. 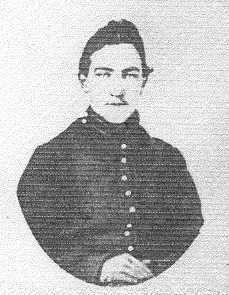 Newhall had five sons in the Union Army, one already killed in action, another a prisoner of war, and he was requesting that his fifth son, who had been wounded, be discharged from service (the discharge was granted). In addition, Schouler informed Governor Andrew in his letter that a Lydia Bixby, a widow, had visited him ten days previous. During the visit, Bixby claimed that five of her sons had died fighting for the Union Army. Governor Andrew forwarded Otis Newhall's request to the United States War Department and also included a brief note suggesting that President Lincoln honor Mrs. Bixby with a letter. The War Department responded by requesting that Schouler first visit face-to-face with Mrs. Bixby to obtain the names of her soldier sons and the units to which they belonged. This was done, and Schouler sent his report to the War Department on October 12, 1864. Secretary of War, Edwin Stanton, then forwarded the report to Lincoln around October 28. Arthur Edward Bixby - Private, Company C, 1st Massachusetts Heavy Artillery. On May 28, 1862, Arthur deserted from his unit at Fort Richardson, Virginia. Mrs. Bixby later attempted to secure a discharge for Arthur, claiming that he was not of legal age to enlist. Arthur returned to Boston after the war and passed away in Chicago in 1909. Charles N. Bixby - Sergeant, Company D, 20th Massachusetts Infantry. Charles was killed in action on May 3, 1863, near Fredericksburg, Virginia. Henry Cromwell Bixby - Corporal, Company G, 20th Massachusetts Infantry and later Company K, 32nd Massachusetts Infantry. Henry mustered out of service on December 17, 1864, and later passed away at Milford, Connecticut on November 8, 1871. Oliver Cromwell Bixby, Jr. - Private, Company E, 58th Massachusetts Infantry. Oliver was killed in action on July 30, 1864, near Petersburg, Virginia. George Way Bixby - Private, Company B, 56th Massachusetts Infantry. In official records he appears as George Way. Initially, George was held as a prisoner of war after being captured at Petersburg, Virginia, on July 30, 1864. He was later removed to Salisbury Prison in North Carolina, arriving there on October 9, 1864. Military reports conflict as to what happened to George after his arrival at Salisbury Prison. It is believed that he either died at the prison or deserted and joined the Confederate Army; there is credible evidence to support both of these conclusions. Thus, at the time Lydia Bixby had met with Adjutant General Schouler, only two of her sons, Charles and Oliver, had died as members of the Union Army; George was still alive as a prisoner of war and yet to arrive at Salisbury Prison in North Carolina. 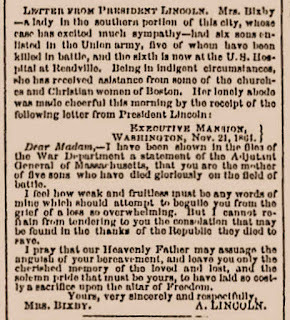 Regardless, President Lincoln was not provided with the full details surrounding the Bixby soldiers at the time he wrote his letter to Mrs. Bixby. 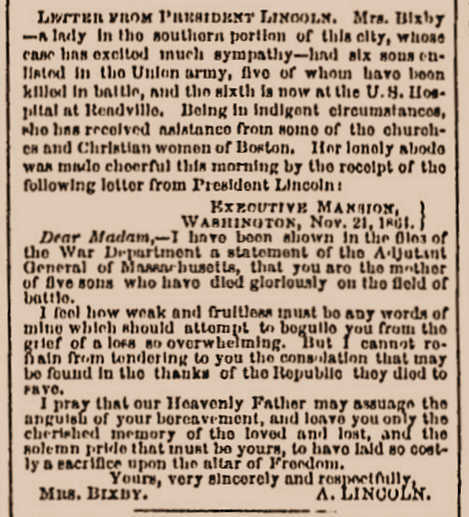 By November 25, 1864, the Bixby Letter was published by the Boston Evening Transcript. Hundreds of newspaper republished the letter creating an enduring legacy of Lincoln's ability to emotionally move people with a strong message written with few words. First publication of the "Bixby Letter" written by Abraham Lincoln. Source: Boston Evening Transcript, November 25, 1864. Porter County can claim its own "Lydia Bixby." Ironically, her name was also Lydia and she was a widow prior to the commencement of the Civil War. Rather than having nine children like Mrs. Bixby, she had thirteen. Her name was Lydia Whitehead (Phares) Jones. Lydia Whitehead (Phares) Jones had five sons and two sons-in-law serve in the Union Army during the Civil War. Three sons and one son-in-law perished while in service to their country. A fourth son returned home from service in such a battered condition that he never fully recovered, dying two years later. Lydia was born June 2, 1803, in New Jersey, the daughter of Robert and Mary (Clevenger) Phares. On September 23, 1823, Lydia married Jonathan Sellers Jones at Xenia, Greene County, Ohio. Jonathan was born on November 5, 1800, in Highland County, Ohio, the son of Erasmus and Mary Ann (Sellers) Jones. In 1841, Jonathan and Lydia, along with their children, moved from Ohio to Liberty Township, Porter County, Indiana. Photograph of Lydia Whitehead (Phares) Jones. Source: Collection of Mike Holt. 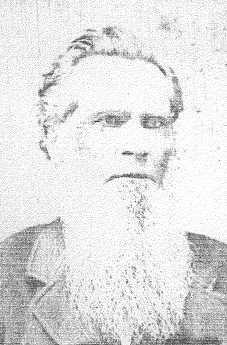 Jonathan Jones died on his 80 acre farm in Liberty Township on October 6, 1855; he was 54 years old. His farm was located at the southwest corner of the intersection of present day county roads 700 North and 50 West. Jonathan was buried nearby in Kimball Cemetery. Lydia was left a widow with at least three children still living at home, the youngest being nine year old Lydia Ellen Jones. None of Lydia Jones' three sons, nor her son-in-law, were killed in action. Instead, their deaths were the attributable to sickness and disease. This is not surprising. Slightly more than two-thirds of the the estimated 620,000 soldiers and sailors that perished while serving during the Civil War were victims of sickness and disease. Erasmus Jackson Jones - Sergeant, Company M, 12th Indiana Cavalry. Died of "chronic diarrhea" on March 22, 1865, at Vicksburg, Warren County, Mississippi. Benjamin Deluna Jones - Corporal, Company M, 12th Indiana Cavalry. Died of "intermittent fever" on April 13, 1865, at Barracks General Hospital, New Orleans, Orleans Parish, Louisiana. Intermittent fever relates to a fever characterized by intervals of normal temperature. It is possible that Benjamin's cause of death was malaria, which very commonly results in intermittent fever. John Phares "Jack" Jones - Private, Company B, 151st Indiana Infantry. Died of "bloody flux" on June 25, 1865, at Hospital No. 2, Nashville, Davidson County, Tennessee. Bloody flux is commonly known today as dysentery, an infection that inflames the intestine and results in bloody stool. 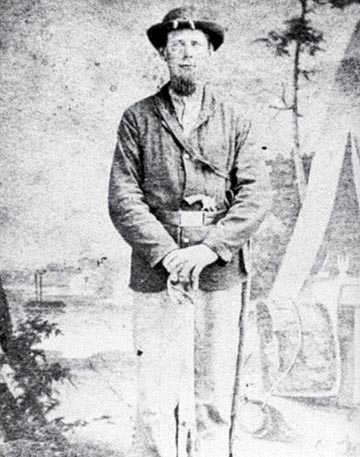 Ephraim Konrad Loux - Quartermaster Sergeant, Company M, 12th Indiana Cavalry. Died of disease May 20, 1865, at New Orleans, Orleans Parish, Louisiana. Allen Phares Jones - Private, Company F, 42nd Indiana Infantry. Jonathan Sellers Jones - Private, Company M, 12th Indiana Cavalry. Jonathan reportedly returned home "broken in health" and never fully recovered. He died September 7, 1867, in Porter County, Indiana. James S. Bradley - Sergeant, Company M, 12th Indiana Cavalry. Thus, within a period of less than 100 days (March 22 to June 25, 1865), Lydia Jones lost three sons and a son-in-law. Her losses were as significant as Mrs. Bixby's. each corner and two concentric circles composed of 12 and 19 stars. Source: ehistory, The Ohio State University, Department of History. Surprisingly, only one mention of Lydia's losses can be found in local Porter County newspapers. On February of 1935, Martin L. Phares, a nephew of Lydia Jones, wrote a letter to Arthur J. Bowser. Bowser featured a regular column titled "Siftings" in The Vidette-Messenger of Valparaiso that mostly covered regional history (Bowser had been the publisher of The Chesterton Tribune prior to his employment with The Vidette-Messenger). Bowser printed Phares' letter in its entirety in his February 16 column. The reminiscing letter recalls the Civil War service of the five Jones brothers and two sons-in-law of Lydia Jones. Lydia Jones. James served in Company M, 12th Indiana Cavalry. The precise number of Porter County men that served in the Civil War is unknown. In 1868, the Indiana Adjutant General published an enumeration of Indiana men that fought in the Civil War; within this list are 917 men from Porter County. A. G. Hardesty published a Porter County Soldiers' Reference in his 1876 Historical Atlas of Porter County, Indiana. Hardesty's list contains a total of 1,103 records of Porter County servicemen. The 1882 history of Porter County published by Goodspeed and Blanchard provides a Roll of Honor of 149 individuals that perished while serving with Union forces, which was republished in the Lewis Publishing Company's 1912 History of Porter County. According to the 1860 Federal Census, there were 10,313 residents in Porter County. Collectively, these numbers suggest that approximately ten percent of Porter County's inhabitants enlisted for service in the Civil War - or roughly twenty percent of the county's male population. Below is a brief genealogical overview of the immediate family of Jonathan Seller Jones and Lydia Whitehead (Phares) Jones. The Jones' children have been listed in the order of their birth. Children: Abner, Louisa, Hulda A., Isabella E., Oscar R., James, Lucetta Pearl, and Ida I. Note: Erasmus died of disease while serving in the Union Army as Sergeant, Company M, 12th Indiana Cavalry. Erasmus Jackson Jones (1822-1865), son of Lydia Jones. Children: Samantha A., Lyman D., and Lydia L.
Note: Robert served as the Town Marshal of Valparaiso (1866-1870), Porter County Deputy Sheriff (1870-1872), and Porter County Sheriff (1872-1878). Note: Jack died of disease while serving in the Union Army as Private, Company B, 151st Indiana Infantry. Charlotte remarried to George Culp. Note: Allen served in the Union Army as Private, Company F, 42nd Indiana Infantry. Note: Elizabeth's husband, James S. Bradley, served in the Union Army as Sergeant, Company M., 12th Indiana Cavalry. Note: Rachel was widowed twice before remarrying. Her third husband, William Nathan Kipling, served in the Union Army as Private, Company C, 99th Indiana Infantry. Note: Jonathan served in the Union Army as Private, Company M, 12th Indiana Cavalry. He returned from the Civil War "broken in health." He never fully recovered and died in 1867. Jonathan Sellers Jones (1840-1867), son of Lydia Jones. 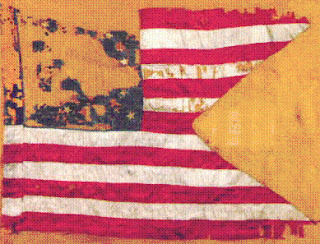 Note: Benjamin Deluna Jones died of disease while serving in the Union Army as Corporal, Company M, 12th Indiana Cavalry. 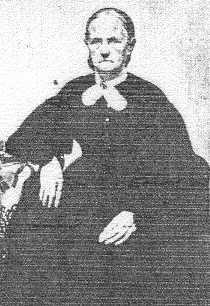 Note: Lydia's first husband, Ephraim Konrad Loux, died of disease on May 20 (or 21), 1865, at New Orleans, Orleans Parish, Louisiana, while serving in the Union Army as Sergeant, Company M, 12th Indiana Cavalry. Ephraim is interred at Chalmette National Cemetery, Chalmette, St. Bernard Parish, Louisiana [Plot: Section 83, Grave 6812]. I extend my sincere thanks to Steve Mockler for his generous assistance and editorial suggestions in the preparation of this blog post. Bierce, Ambrose. 2000. Tales of Soldiers and Civilians and Other Stories. New York, New York: Penguin Books. 274 p.
Bullard, F. Lauriston. 1947. Abraham Lincoln and the Widow Bixby. New Brunswick, New Jersey: Rutgers University Press. 154 p.
McWilliams, Carey. 1929. Ambrose Bierce: A Biography. New York, New York: Albert and Charles Boni, Inc. 358 p.
Randall, James G. 1951. Constitutional Problems Under Lincoln. Urbana, Illinois: University of Illinois Press. 596 p.
Terrell, William H. H. 1868. Report of the Adjutant General of the State of Indiana. Eight Volumes. Indianapolis, Indiana: Alexander H. Conner, State Printer. Anonymous. 1898. Memorial Opera House. Headlight, Sights and Scenes Along the Grand Trunk Railway 3(6):8. Boston Evening Transcript, Boston, Suffolk County, Massachusetts; November 25, 1864; Volume 36, Number 10613, Page 2, Column 5. Untitled column. The Vidette-Messenger, Valparaiso, Porter County, Indiana; February 16, 1935; Volume 8, Page 8, Column 1. Column titled "Story of Aunt Lydia Jones," by Martin L. Phares. The Vidette-Messenger, Valparaiso, Porter County, Indiana; March 25, 1960; Volume 33, Number 223, Page 1, Columns 7-8 and Page 5, Columns 3-4. Column titled "Old Records on Memorial Opera House are Checked." The Times, Muster, Lake County, Indiana; October 5, 2015; Column titled "Guest Author to Recount Civil War Sacrifice of Northwest Indiana Volunteers," by Marc Chase. The Times, Munster, Lake County, Indiana; April 29, 2016; Column titled "Sons of Union Vets Working to Restore Civil War Gravesites," by Joyce Russell."